Now this is the way to really live outside! 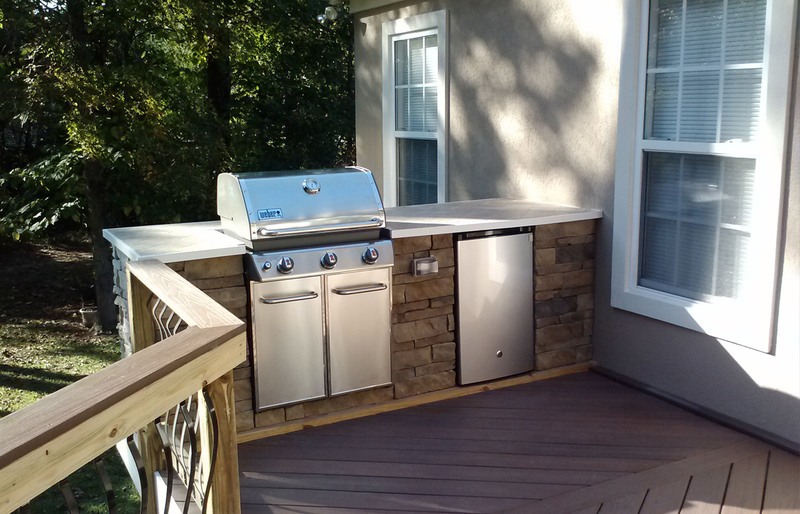 If you’re thinking about adding an outdoor kitchen with your new outdoor living area, you’ve made a great choice. There’s a reason that the kitchen is often one of the most popular rooms in the house. One key reason is the great interaction between the person preparing the food and the rest of the family or guests. Whether coming together for a meal or for hors d’oeuvres, the host or hostess really enjoy talking and spending time with the family and guests while they are preparing the food. Great meals are about more than the food, they are also about the time spent together while preparing the food. Imagine when the chef that is left inside the house preparing and cooking while the rest of the family hangs is out in the backyard. Wouldn’t it be fabulous to enjoy that same quality time outside of your kitchen? An outdoor kitchen provides exactly that! And, while one adult may often be the one preparing food indoors, other family members often hear the call to join the cooking once it is moved outside. In addition to community, there are some more practical benefits to cooking outside. One key benefit is the task of transferring the food. Sometimes your exterior kitchen door isn’t very close to your outdoor eating area. Or, perhaps there is a step down from the house causing you to forever caution people to “watch their step” when exiting the home. If your family loves eating outside, it’s a lot easier to transfer food from the outdoor cooking area to the picnic or other outdoor eating area. 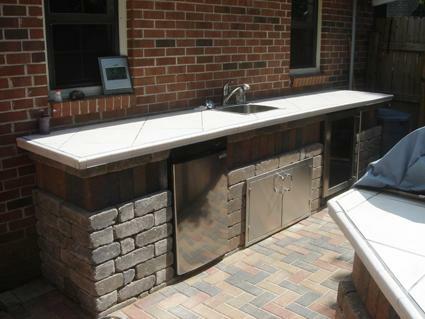 In planning your outdoor kitchen, how do you decide what to include? One thing that will be included is a grill. Here are some questions to decide what else to include. How much counter space would you like? Are you going to be using that counter space for serving as well as preparing? Will you be using the counter space for beverages? If so, it might be a great option to integrate a bar into your kitchen. Adjoin the bar to the far side of the grill area so the grill chef can socialize with those at the bar while cooking. Additional outdoor kitchen features include food storage areas, bread warming areas, grill tops and even an outdoor sink. 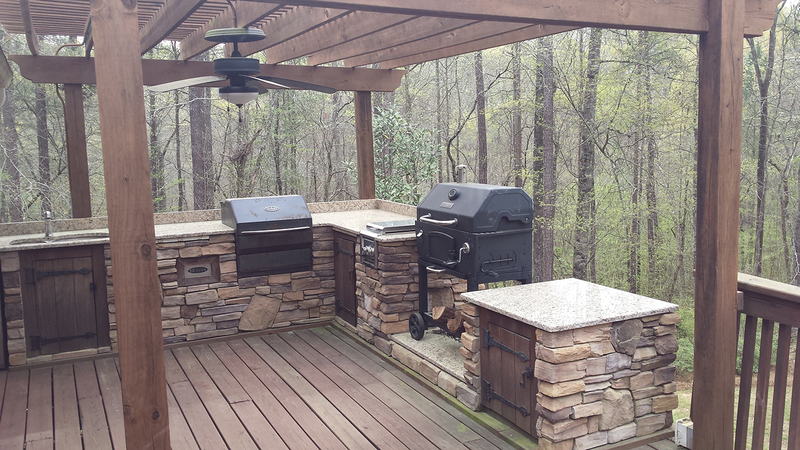 Give us a call and we will provide a free demonstration about adding a new outdoor kitchen to your Central GA backyard. 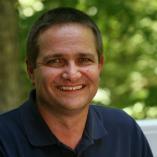 Call (478) 745 – 2000 or drop us an email. 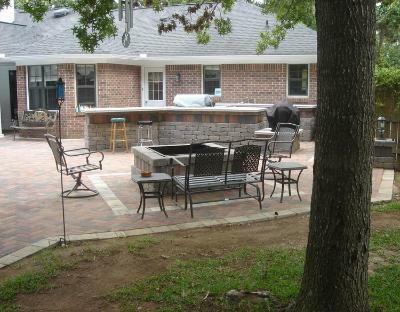 You may also want to take a look at the outdoor kitchen photo galleries on our website.